Reyna thought “no more work.” But that quickly changed, she said. Texas has a number of retired teachers now worried that their pensions may be lowered next year. The state’s Teacher Retirement System board voted on Friday to lower the expected rate of return on investments, meaning the state is predicting it will earn less money to use for benefits. Retired educators said they are now looking to the Legislature to make sure more funding is secured for the TRS pension fund in light of Friday’s vote. At a time when the cost of living is rising, retired teachers are trying to survive within their fixed incomes — which has been difficult, according to several retired teachers who testified at the board meeting. The board’s decision to lower the expected rate of return on investments could signal a potential decrease in pension benefits and contribution rates, which are set by the Legislature — and retirees are looking to lawmakers to help offset the new expected rate, said Monty Exter of the Association of Texas Professional Educators. The decision to lower the rate was based on estimates from financial experts who predicted how the rates would operate in future economic situations. Exter acknowledged that the board had a “fiduciary duty” to make decision on the fund based on advice from experts. “We have looked at a variety of forecasts,” said Brian Guthrie, TRS’s executive director. Guthrie added that it’s the board’s responsibility to look at what actions to be take in light of updated financial forecasts, a system of determining how current and future fiscal situations could impact policy and other decisions. Despite the board’s decision on Friday, Ted Raab of the Texas American Federation of Teachers said he’s confident legislators will provide additional funding after the healthcare increases and budget cuts. Raab said they already have allies in the Legislature like state Rep. Terry Canales, D-Edinburg, who has already asked Gov. Greg Abbott to make funding for teacher retirees an “emergency item” for next session. But Reyna said she saw deductibles rise after the Legislature’s decision, which has caused her to struggle to pay her health care costs. Lawmakers say the uncertainty surrounding the budget makes it hard to allocate better benefits for educators. Many teacher retirees are already strategizing to get on lawmaker’s radars in order to secure the funding they need to keep their pension stable. 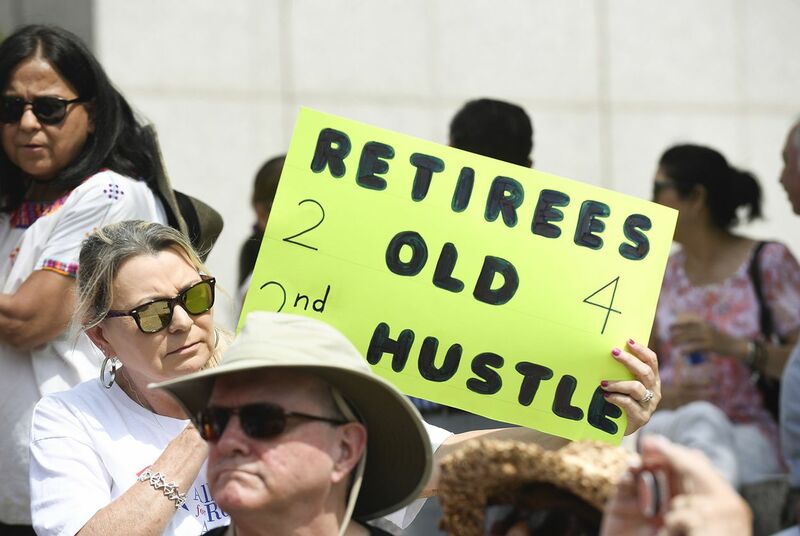 Although the next step for many teacher retirees is to start the fight for funding at the Legislature, Rita Runnels said retirees just want “respect” from lawmakers when it comes to basic survival.